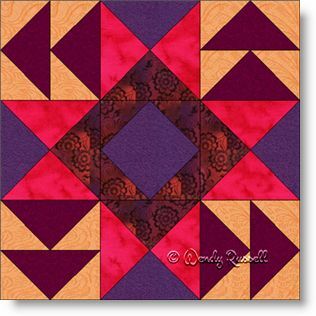 The Ohio Star in Flight quilt block is a choice for those quilters who want to brush up on some of the quilt patches you might not use frequently. These patches are the square in a square and the quarter square triangles. You will also make several flying geese patches, but those make frequent appearances in many quilt blocks. I chose this title for the nine patch quilt block as it contains the patches that make up an Ohio Star, but the flying geese patches led me to try to be clever with the name of the block. I did not find it in any of my reference books. The two sample quilts illustrated use standard quilt block settings -- a side by side layout which produces a secondary pattern of pinwheels where the blocks join, and also an on point setting with additional, colourful, blank blocks to showcase some quilting designs.